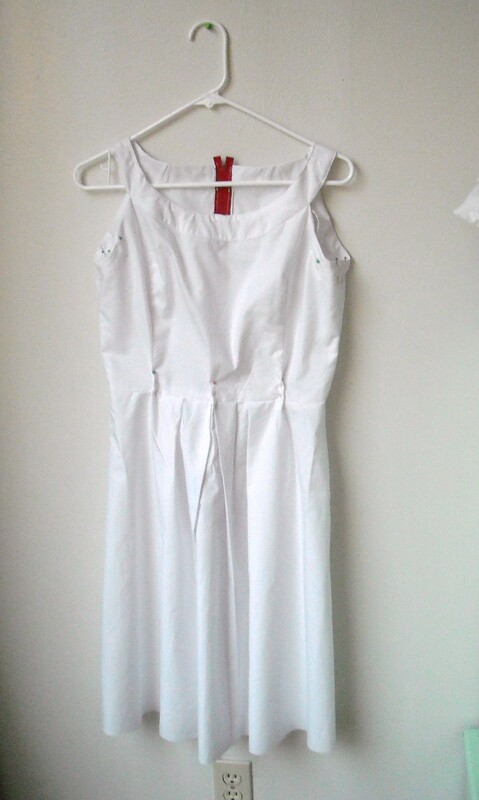 Weekend: dress toile, concert, and dyeing fabric for the first time! Hope you all had a lovely weekend, readers! I had quite a busy and productive weekend, and I thought I would share some of the highlights with you all! First up is the toile for the ‘Wing it On” dress commission that I’m working on! I used Simplicity 2588 as the base, and except for taking in a little excess at the waist, it fits! 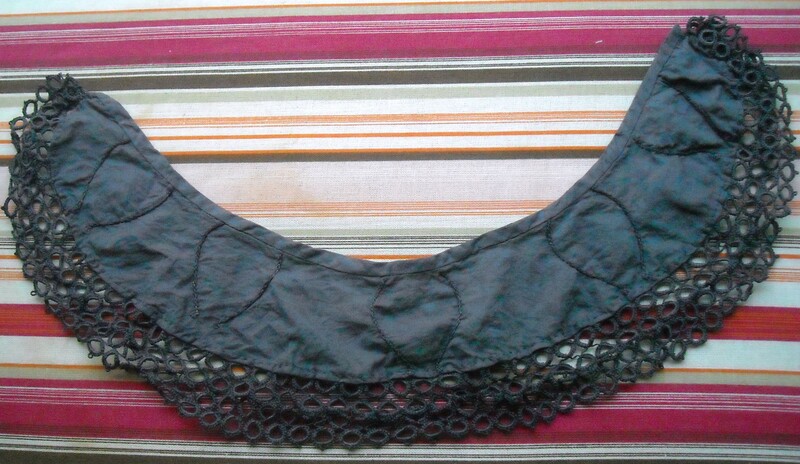 I’ll probably do a gathered rather than a pleated skirt on the final version, tho. After the dress fitting (and subsequent little dinner party I threw together) I headed downtown with some of my closest friends to see Ingrid Michaelson play! Readers, she was amazing live. Incredibly funny, witty, and talented. Unfortunately, I didn’t get any really good photos (our seats were up on the balcony), but luckily somebody on Youtube has kindly uploaded one of her songs from last night, and you can view it here. Finally, I dyed some fabric for the first time today! 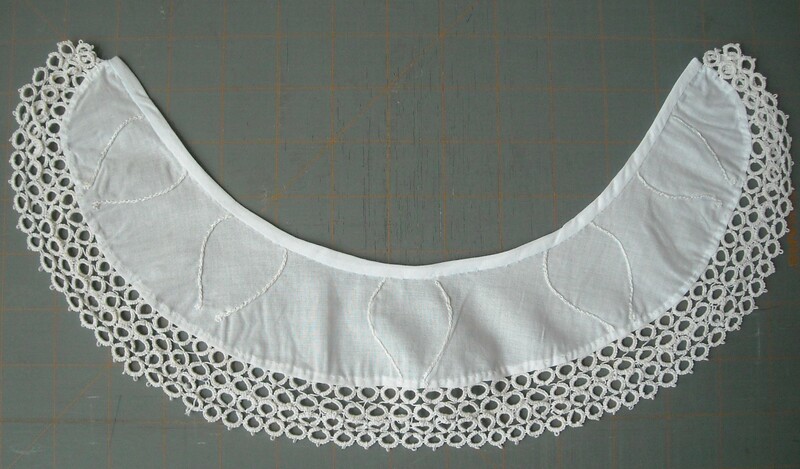 I’m working on a collar reproduction for the exhibit that opens this week, and the collar needs to be black, but the vintage tatting that I used was white, so I decided to construct the whole thing in white and then dye it. Anyways, I got the white collar done . . . .
. . . . and then dyed it and it came out dark purple! Not quite the color I was going for . . .
Alright, off to get myself ready for tomorrow before Mad Men comes on! Have a nice evening, everyone! Next Post First reenactment of the 2012 season, a dress for a little girl, and the exhibit opens! Trash bag in a plastic tub?! It’s a revelation! I’ve been dying [haha] to dye fabric, but unsure where I could actually do it, so this is a great suggestion! He hee! Wish I could take credit for this tip, but it’s all thanks to Project Runway. 😉 Can’t wait to see how your dyeing projects turn out!